A well-connected regional trail network promises to transform public life by linking diverse communities, promoting healthy lifestyles and building sustainable local economies. There is an inherent legacy in trails. One that honors the past, enriches the present and provides a gift to the future. Life involved dialogue between us and nature. We communicate through our actions, and nature responds—sometimes angrily, as with droughts or floods, sometimes tenderly, as with singing birds or leaves dancing in the breeze. By bringing us close to nature, trails promote kinder, gentler conversation. Nature has no quarrel with trails. Our common goal is the creation of a nationwide network of multi-use trails—local, regional, and national systems—that allow walkers, bicyclists, people with disabilities, equestrians, runners, skiers, hikers, and others to enjoy the beauty of the American landscape. No single individual should be able to unravel the tapestry of railroad corridors in our nation which took generations to weave together, at the expense of the great sweat and toil of American workers. In the nineteenth century we built the railroad system and in the twentieth century we built the highway system. 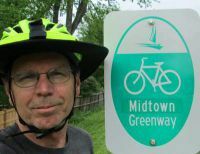 In the 21st century we will reconnect America with a network of trails and greenways. My vision is to change the map of American. Trails and parks are as necessary to communities as roads, sewer systems and utility grids.